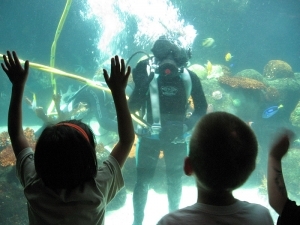 The Minnesota Zoo’s Aquariums Department is responsible for maintaining the health of more than 225 aquatic species, including fish, invertebrates, amphibians, reptiles and two species of sea turtles. A filtration system encompassing 20 exhibit tanks, 50 fish quarantine tanks, and more than five reptile and amphibian quarantine tanks support the lives of these aquatic creatures. Among the exhibit tanks are a 95,000 gallon Indo-Pacific Reef fish aquarium and a 230,000 Caribbean shark aquarium. Interns learn how to set up and maintain aquarium exhibits, support and monitor the health of the aquatic species in the Minnesota Zoo’s collections, and interpret these collections for visitors through demonstrations and presentations, including the tropical reef dive demonstration and the shark feeding presentation. Interns who are SCUBA certified may participate in tank maintenance and dive shows as appropriate.